← From librarian to exorcist. What’s a gal to do if she starts seeing ghosts and demons? She’s a small town librarian and an exorcist . 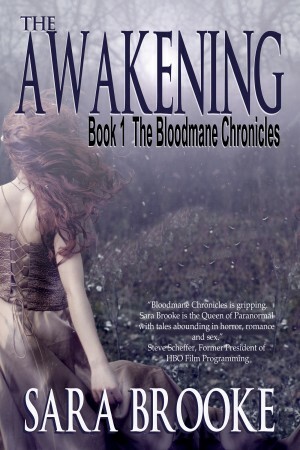 . .
Today’s Sneak Peek is from the paranormal (with romantic elements) The Awakening: Book 1 The Bloodmane Chronicles by Lachesis Publishing author Sara Brooke. The Awakening is a compelling and riveting book about a librarian who discovers she has the ability to perform exorcisms on people who are possessed by demons. So I decided to be brave and find out. Sitting up, I slid my feet into my favorite green slippers and slowly shuffled to the door. Jane hadn’t moved and remained in her upright position. She didn’t greet me as I walked up, nor did she turn her head for a gentle petting. When I opened the door, she raced out and disappeared into the darkness. I whispered her name, trying to get her to come back, but it was impossible to see where she’d gone. I was immediately distracted in my effort to find her, because the hallway was now filled with a strange yellow glow and it helped my eyes adjust to a very unusual sight. There, in the middle of the hallway, was a large group of people, but there was something wrong with them. One woman was leaning over the railing, rocking back and forth and singing songs to herself, while a trail of vomit leaked out of the side of her pale mouth and traveled down her neck, staining her old fashioned white blouse. A man was slowly walking down the hallway, dragging an ax behind him, but he was missing one of his arms. Two children played together in the center of the hallway, but they were both badly burned. And there were many more people, but they all looked injured or . . . dead. My mind raced and threatened to shut down altogether. In the midst of the chaos, small white orbs traveled up and down the hallway. Once in a while, an orb would stop and then grow until it became one of the ghosts. Other times, an orb would simply flit around back and forth until it connected with a wall and disappeared. The voice came from behind me and nearly caused my heart to stop. Cole stood there amidst all of the strange people, yet despite his handsome profile, seemed to fit in perfectly. Perhaps it was the fact that he was pale like the others or that he was wearing clothing not of this era. But unlike the others, he made my heart race from fear and something else―was it attraction? I couldn’t be sure. It didn’t matter. He was as weird as the rest of them, and I needed to be on my guard. You can get The Awakening at Lachesis Publishing, as well as amazon.com, barnes and noble, kobo, and iTunes. Sara Brooke is an Amazon bestselling author of horror, paranormal romance, and suspense fiction. A lifelong avid reader of all things scary, Sara’s childhood dream was to write books that make readers sleep with their lights on. She hopes that isn’t too troubling for the thousands of readers worldwide who have purchased her books. Sara resides in beautiful South Florida. You can Like Sara’s facebook page – called, The Bloodmane Chronicles . Connect with Sara on facebook and on her website. Sara welcomes feedback and questions from readers.